To calculate heat production, multiply ml CO2/kg·hr by 440 to get Btu/ton/day or by 122 to get kcal/metric ton/day. 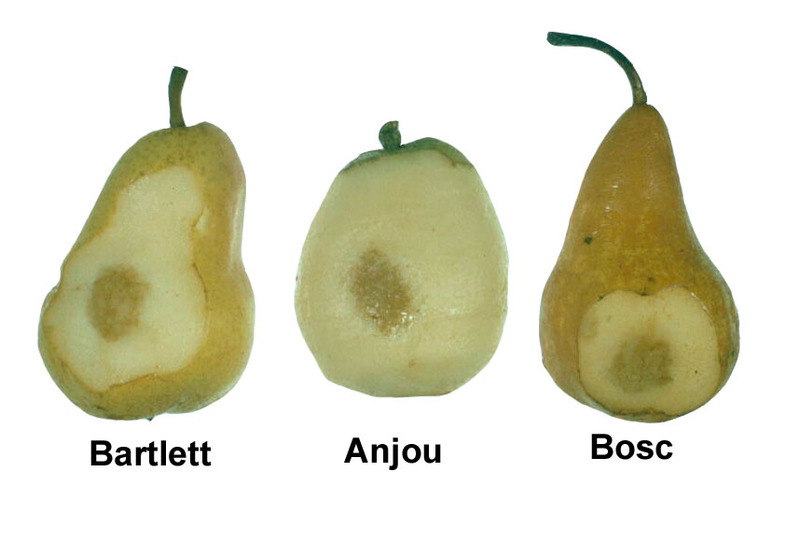 Low end for 'Anjou' and high end for 'Bosc' and 'Comice' pears. Treating pears with 100 ppm ethylene for 1 to 2 days can substitute for cold storage [4 to 8 weeks at -1 to 0°C (30 to 32°F)] in enhancing ripening. Optimum conditions for ripening are 15-22°C (59-72°F; the higher the temperature the faster the ripening) and 90-95% relative humidity; CO2 should be kept below 1%. Winter pear varieties can be stored in CA at -1°C (30°F) for up to 4 months (Bosc & Comice) or 6 months (Anjou) while maintaining their capacity to ripen and attain good flavor and texture. Bitter pit (Cork spot, Anjou pit). Brown, corky lesions appear in the flesh, mainly toward the calyx end. An uneven surface with darker colored depressions indicates pitted tissue. High rates of nitrogen application increase the incidence of bitter pit while calcium sprays before harvest decrease its occurrence. Carbon dioxide injury. Browning of interior walls of carpels and adjacent core tissue; in severe cases cortex tissue turns light brown and cavities may develop in damaged tissue. 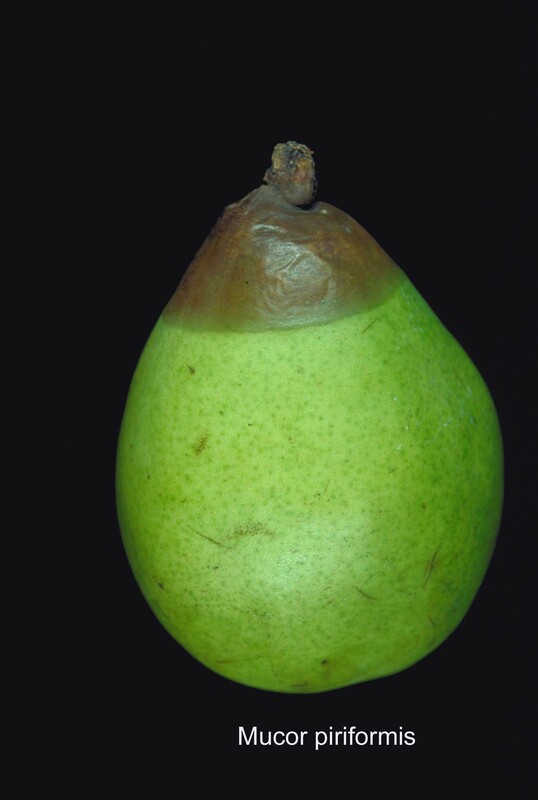 Susceptibility of pears to CO2 injury increases with advanced maturity, delayed cooling, prolonged storage, and low O2 levels during storage. 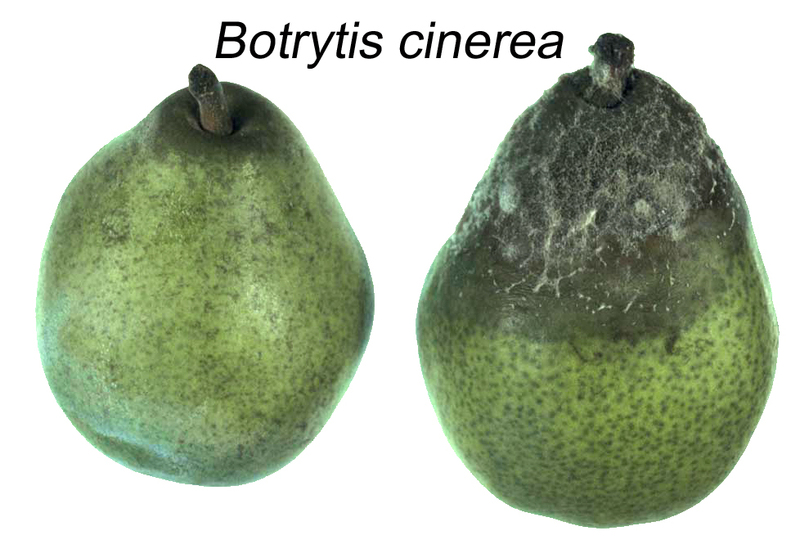 Botrytis rot (grey mold), caused by Botrytis cinerea, is the most serious storage disease of pears. 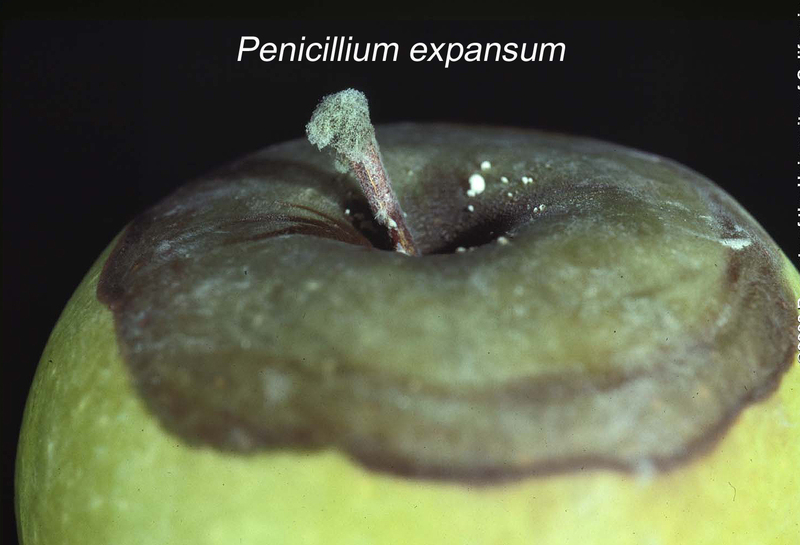 Blue mold, caused by Penicillium expansum, is the second most important one. 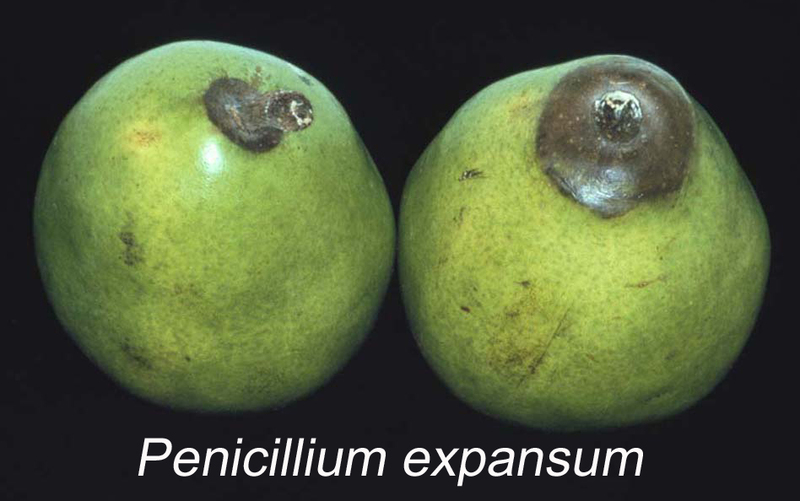 Alternaria rot (Alternaria alternata) and cladosporium rot (Cladosporium herbarum) occur only on senescent fruit at the end of the storage period. Side Rot (Phialophora malorum) is a significant problem in the Northwest. Mucor rot (Mucor spp.) may also attack pears in storage. 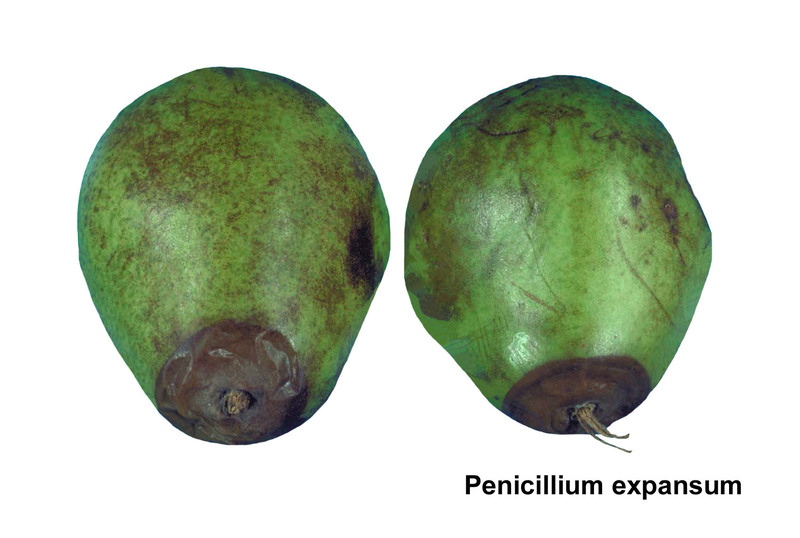 Anthracnose rots (Bull's-eye rot, Cryptosporiopsis curvispora); lenticel rot, (Phyctema vagabunda); and bitter rot, (Colletotrichum gloeosporioides) can be a problem only if preharvest control treatments are inadequate.